Jan. 14, 1987. As Chun Doo-hwan commends his loyal police lapdogs with medals, an ambulance hurries to a shabby building in Namyeong-dong, Seoul. Out comes a doctor who is ordered by a shady man to revive a young man -- clearly dead. After vain attempts, the doctor declares him dead. 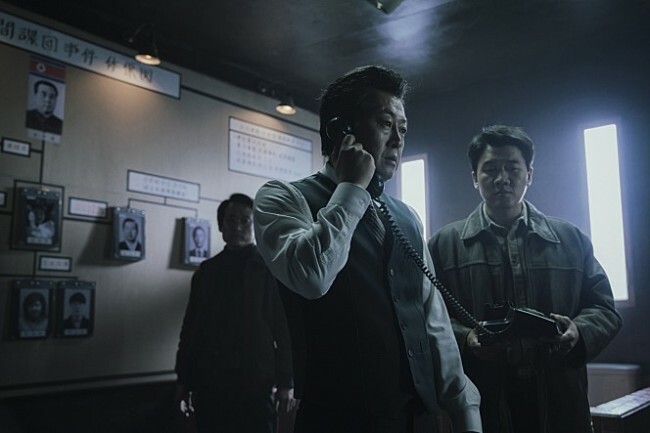 Jang Joon-hwan’s “1987: When the Day Comes” is based on the real-life story of the democratic movement of 1987 that led to a direct presidential election later that year. It tells of a harrowing series of events that took place after the torture and death of student activist Park Chong-chul. “I never imagined that I’d say the infamous line. I remember seeing the words all over the newspaper, and now I got to say it,” Kim Yoon-seok, who plays devilish investigator Park Cheo-won, said at the film’s premiere on Wednesday. Kim, the master actor who portrayed iconic baddies in “Tazza” and “The Yellow Sea,” sets out to play a role that is more than just evil. Like many of those who worked for the authoritarian regime, he truly believes he is a patriot doing what is necessary. His character and that of Park Hee-soon -- who plays one of the cops directly responsible for Park Jong-chul’s death -- represents those that lost sight of morality and justice, monsters created by their times. Standing opposite them is stubborn prosecutor Choi Hwan, played by Ha Jung-woo, who refuses to fall in line with the regime’s attempt to disguise the torture death as a mere accident. Ha’s role, while pivotal to the plot, is surprisingly small for the well-reputed actor. Instead of focusing on one protagonist, the movie focuses on how people in various roles cooperated in bringing the regime to justice. “I wanted to make a film in which different characters take the main role, and ultimately lead to every person in the country becoming the protagonist,” said Jang. Characters that attest to Jang’s design are the uncle-niece pair of Byeong-yong and Yeon-hee, played by Yoo Hae-jin and Kim Tae-ri, respectively. Byeong-yong, a guilt-stricken prison guard, is a messenger for the civic activists. He asks Yeon-hee to deliver the letters in his stead, which she does only half-heartedly. Yeon-hee represents the everyday people who come to realize their tiny contributions -- when they all come together -- can bring down the whole administration. The film is a tear-jerker, but not in a forced sob-fest kind of way. The emotion comes from the sheer weight of the real-life tragedy. This is best represented in the reaction of Park Jong-chul’s father to his son’s death. The father does not shed a single tear at the morgue or funeral, nor while the family scatters his son’s ashes in a river. But in one of the movie’s most powerful moments, when he sees his son’s ashes collecting on the river banks, he finally breaks down and steps into the icy water. Not even feeling the cold, he sobs as he cries out the name of the deceased. The movie finds just the right balance between fiction and reality. Many of its characters are based on real life, but it does mix them up with fiction to propel the plot. It is not afraid to be tearful, but it does not get mawkish. Instead it relies on the overwhelming weight of the truth. The hours and days of cruel torture, death threats, the struggles and the victory: It is not just a story, it happened. “1987” hits local theaters on Dec. 27.